Let us imagine that you have collected spare change from the sofa cushions, you have grown your fingernails for a month, you have dug for your car keys to put them to good use and you have even gotten your kids in on the action. That need—the immense euphoric joy – that comes from scratching off a instant win lottery ticket. For sure, it is a pleasure to receive great gift for your Birthday (or you can buy this gift by yourself), in the form of scratch card ticket that offer excitable moments of scratching-off in hope to win some bugs! Amazing! “Pick me, pick me! You might just win and quit your day job." The latter is a wonderful thought, isn't it? Just think of the things you could do. It is that thought that American dream of having a better, more fulfilling life that keeps you coming back week after week, month after month, finding the joy of scratching off each lottery ticket you purchase. Please do not worry, even if you only win five dollars more than you spent, you have won something. On the right picture: Vacation-themed Sea and Sun scratch card. There's an innate feeling that you have accomplished something amazing and it's a feeling you are quick to tell your friends and colleagues. Now, the joy of scratching off has gone a step further and is beginning to appear online to further feed your need to play, much to the chagrin of one state’s lawmakers. Instant prize is what players love! Scratch lottery gaming began in Massachusetts. In May 1974, Massachusetts became the first state in the united States, to sell instant lottery tickets as an alternative to the weekly jackpot game. “The Instant Game” was the first instant ticket then, with a top instant prize of $10,000. It was a lot of money as the purchase power of $10,000 was much much higher than today's $10K. 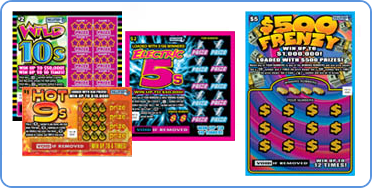 On the left picture, we present some of the instant scratch-off games offered for players in 2014, by Massachusetts Lottery company. 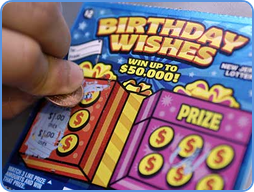 They offer traditional printed scratch-off tickets with sale price range from $1 up to $30. In the digital era and the unlimited software possibilities, many recognized online gaming venues started to offer interactive and colorful online scratch off games. The truth is that both versions of scratch card (printed and online) can coexist peacefully and will remain in favour of players. The fact remains that scratch card gaming itself is a fun and enjoyable pastime for many of us. However, playing scratch cards online have some pleasant advantages. When there is bad weather, rainy fall season or cold snowily winter evening, you do not need to go outside, in order to buy traditional printed scratch-off ticket. Instead, you just log in into your account online and you can start enjoy scratching-off, at the comfortable of your home or office. There is more. You are not restricted to the price of tickets available at retailer. When playing online, you can choose the wagering level (ticket price) as low as from $0.10, at some providers. So, you are probably wondering with so many scratch lottery advancements, how do you get a competitive edge and improve your odds of winning? First of all, it seems important that you set the budget of your scratch cards gaming session and stick with it. While the old adage says “You must spend money to make money,” the adage never says risk your home or livelihood for the chance of wealth that may or may not come. Common sense still rings true and a budget for your gaming sessions is very important so you do not go overboard with spending. Please read the fine print on your card to study the available odds for each scratch off lottery game you play. Please compare the odds of winning of several different cards and decide, which particular game might bring you the most potential winning possibility for the sum of money you spend. Please remember, higher odds are not always associated with the cost of the ticket. Some believe there are the winning pattern concepts on certain gaming cards. If you believe in this principle, please try to study the cards that you purchase and see if you can find the key into the uniqueness of the game. If you buy traditional paper scratch ticket, please do not forget to check your ticket immediately! You would hate to be throwing money away buying a ticket only to learn that you threw a winning ticket. Remember, the most important thing is to appreciate the joy of scratching off, first and foremost. Win or lose, the fun you will have is worth its weight in gold. 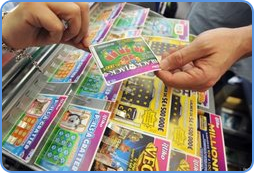 We realize that the excitement and fever of scratching-off the traditional printed scratch card ticket, bring in unique unforgotten moments of pleasure. Many people prefer physical contact with printed paper-based game. However, we strongly prefer to play this easy-going game online. 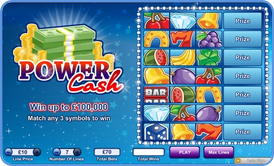 On the left picture: Example of easy-going online scratch card game called "Power Cash" where you have to match three fruit (or other)symbols, in order to win prize. There are three main reasons, why we prefer to play scratch games online. Online scratch cards are interactive games. This means you can choose your favourite game from the range of over 200 games. There are always some games with design and theme that will appeal to you. This online games come with great art design, moving elements and are accompanied by the sound in the background, while you are playing. Pure gaming experience, you cannot achieve playing traditional printed ticket. When playing online, you are in full control of your budget. You can change unit price and number of scratch lines at any time. 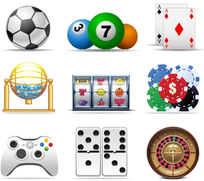 Usually, online game providers allow wagering for as low as $0,10 or similar amount. This means hours of fun for small sum of money. You can play at the convenience of your home or office. All you need is computer and internet access. Play on your desktop, tablet or small mobile device. It's really very easy-going game. We have chosen the world's leading online scratch card gaming sites that are secure, recognized and offers hundreds of quality games. Please do not forget to use the free welcome bonuses, where no deposit is required. Start playing with the top online scratch gaming sites below, which we strongly recommend to use.